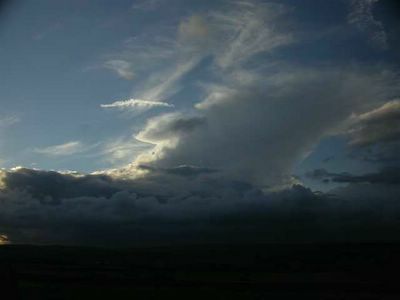 A deteriorating autumnal evening, cold, with several mature cumulonimbus visible, one having passed to the east some while earlier and another on approach and passage east over Airedale during the visit. Wind: W F4, reducing F2. Temp: 8. Visibility: 10km NW max, 60km E max. Cloud: cumulonimbus (four heads visible), together with other big and maturing cumulus, however sky overhead always open c4ok. Small amount of cirrus. Precipitation: none at the watchpoint but very heavy rain and cb tracking into Airedale from Lancashire and proceeding east down the valley. Pressure: falling overnight, troughing out before dawn at c998mb, then rising 1005mb @2130hr. Interestingly tonight Meadow Pipits moving west from 1940hr with a total of 32 counted going west in small groups. Also a wild group of about 20 none movers? were noted in the sky out to the east. No other passerines seen, not even a Swallow!! Curlews and Common Sandpiper still present and ten Golden Plovers were circling and calling before settling down (first returns). Gulls even worse than last night with 38 LBBG and no BHG at all present. A real clearout over the last few days since Mondays big numbers.There was no onward movement noted tonight.